Greenwood, Indiana is located in Johnson County, Indiana. As of the most recent census, this Indiana city was home to almost 50,000 people. Greenwood is the most populated suburb in the southern part of the Indiana metro area and the city shares a border with nearby Indianapolis. For residents of Greenwood, Frank & Kraft is here for you if your loved one has passed away. When someone has died, it usually becomes necessary for that person’s assets to transfer through the probate process. This process can be a complicated one, especially for the executor of an estate who is vested with responsibility of filing court paperwork and facilitating the transfer of assets. Our firm aims to make the process easy. If you will be inheriting after a death, if you have been asked to serve as executor of an estate, or if you believe that a will has been presented for probate that isn’t valid and you want to contest it, you should give us a call as soon as possible. Our legal team will help you to take proactive steps to ensure that the probate process goes as smoothly as possible and that the wishes of the deceased are respected. You can also read on to find out about probate resources in Greenwood and surrounding areas in Indiana. The Johnson County Court website: Here, you can find links to the county website, local rules in effect for Johnson County Courts, and Greenwood City Court rules. This information will help you to be prepared for what to expect when you visit the Johnson County probate court. The website of the Clerk of the Courts for Johnson County: Here, you can learn the role of the court clerk, how court proceedings work, and how to contact the Johnson County courts. 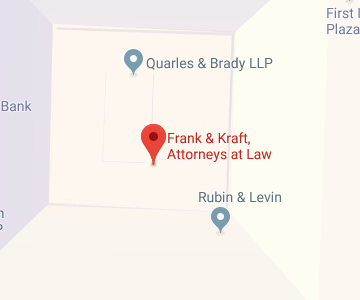 If you must go to court, Frank & Kraft can help. We can represent anyone involved in the probate process to help ensure that the process goes as smoothly and efficiently as possible. Most people who pass away in Greenwood are not going to owe inheritance taxes. That’s because you can pass a substantial amount of money and assets on to your heirs or beneficiaries tax-free. You can also pass an unlimited amount of money and property on to your spouse when you die without having to worry about inheritance tax or estate tax. The website of the Indiana Department of Revenue: This website provides details on inheritance tax rules in the state of Indiana. No inheritance tax is charged on estates if a death occurred after December 31, 2012, so most people won’t need to worry about the state taking any money after a death. However, the website also explains what inheritance tax is and provides answers to frequently asked questions so you can learn more about the tax rules after someone has passed away. The IRS estate tax website: Although the state no longer charges a tax triggered by a death, the federal government still imposes an estate tax. The website from the IRS explains how estate tax works, when a tax will be charged to the estate, and what types of assets are considered to be part of a taxable estate. If you suspect that your estate is going to be subject to tax because you have a large amount of money and property that you will be leaving to someone other than your husband or your wife, you should take appropriate legal action. Frank & Kraft can help you to determine if you have any options for avoiding estate tax and can work with you to create a comprehensive plan for the transfer of your wealth to your loved ones while minimizing any taxes that may have to be paid. The Indiana Probate Court: The state’s probate code is found in Title 29. The four different articles within Title 29 address general probate laws; miscellaneous provisions of the law; guardianship proceedings; and jurisdiction over guardianship proceedings. The Indiana Courts Resources for Legal Resource: There is no substitute for proper legal advice, but you can do some basic research on your own if you want to learn more about the laws that apply to probate proceedings or guardianship in Indiana. The Indiana Courts have a resources section available where you can find many different tools used to learn about the law. These resources include Indiana law libraries, rules of courts in Indiana, law dictionaries and more. Ultimately, to make sure the probate process goes smoothly, you should reach out to an attorney who can offer you personalized help and support with your specific probate issues. Frank & Kraft can help. Greenwood, Indiana probate lawyers at Frank & Kraft are here and ready to offer you personalized assistance throughout the entirety of the probate process. To find out more about how our firm can help you, join us for a free seminar. You can also give us a call at 317-684-1100 or contact us online today to talk with a compassionate and knowledgeable member of our legal team.